This book makes a comparative analysis of the European and the East African Economic Communities. The Author points out that up to this moment the East African Community has not reached the technological and institutional competence of the EU. She discusses the developments leading to the re-established East African Community from the time it collapsed in 1977 to date. 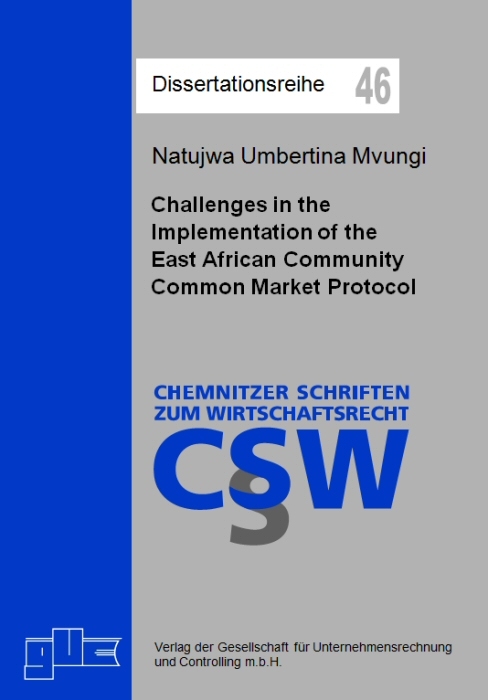 It is a scholarly treatment of the different Articles of the East African Common Market Protocol that focuses on their effectiveness, short comings and successes. The Author suggests the way forward for the emerging East African Common Market in the context of African and trade imperatives. Zur Autorin: Natujwa Mvungi, geb.1982, studierte in der Zeit von 2002 bis 2006 Rechtswissenschaften an der University of Dar es Salaam, Tanzania. Von Oktober 2006 bis Juli 2007 absolvierte sie ihren LL.M. an der Universität Hamburg. Anschließend promovierte sie von 2007 bis 2010 an der Technischen Universität Chemnitz. Seit Dezember 2010 arbeitet sie als Dozentin an der University of Bagamoyo in Tanzania.